The Outdoor Industry Association in the US recently published its 2016 report with estimates of outdoor recreation participation in the US in 2015. The release is reported at cycle-helmets.com, which previously displayed OIA estimates to 2012 that showed the 6-17yo proportion cycling on roads and paved surfaces was 45.2% in 2006 (17,401,000 / 38,457,000) and 31.6% in 2012 (12,397,000 / 39,232,000). These new figures show the 6-17yo proportion of all cyclists was 45.2% in 2006 (17,401,000 / 38,457,000) and 27.9% in 2015 (10,696,000 / 38,280,000), i.e. down from 31.6% in 2012. In other words, the number of 6-17yo Americans cycling on roads and paved surfaces fell by 6,705,000 or 38.5% over the 10 years. The 6+ participation was down by 177,000 from 2006 to 2015 which, because of population growth, represents a 1.0% drop in population percentage, i.e. adult road cycling in the US has increased by a bit over 6.5 million over the past decade and all the reduction has been among 6-17yo who are subject to mandatory helmet laws in half the American states (in all states if parental, school and local government coercion is taken into account). Overall, 6+ road cycling participation in 2015 was 2,068,000 fewer than in 2011. It is bizarre that participation data such as this receives no publicity while Americans puzzle over why their kids are the fattest on earth. On March 23rd 2018, our South Australian co-ordinator and National Vice-President Sundance Bilson-Thompson was in court in Adelaide challenging a bike helmet fine. Those of you who have listened to one of Sundance’s presentations will know what a good grasp he has of the statistics and arguments around bike helmet law. Although the Magistrate and the Prosecutor were clearly impressed with his defence, absurd add-on costs made his victory meaningless. The costs imposed by the Court were paid for out of our Court fighting fund https://www.gofundme.com/changehelmetlaw. On March 23rd I went to court to fight a fine I’d received for failure to wear a bike helmet. My strategy was to appeal to section 15 of the Criminal Law Sentencing Act, which states that if a defendant is found guilty, the magistrate or judge can take several steps including dismiss the fine and record no conviction if they deem the offence to be “trivial”. I intended to argue that as the health benefits of regular cycling outweigh the injury risks about ten to one, my actions were actually beneficial to society and hence should be judge as trivial. I prepared a brief document referencing the health studies which proved this. When I got to the stand, it was actually the police prosecutor who was most sympathetic to my case. Failure to wear a helmet is what’s called a “strict liability offence”, meaning it’s basically a matter of fact that you did it, or you didn’t. There are no real grades of technicality (such as how responsible you are in a manslaughter case, for example). The magistrate didn’t really seem to pay much attention to the argument I was making about health benefits, but the police prosecutor actually said that the point I was making was interesting, and they’d be happy with a minimal fine and no recorded conviction. So the fine was dropped from $102 to $20. Not a bad outcome, as moral victories go. Now here’s the rub; in South Australia we have this strange beast called the victims of Crime Compensation levy, which came to $60 (hence the original fine was $162), even though failing to wear a helmet is a victimless crime. And it turns out that simply by taking the case to court, the VoCC goes up automatically to $160, and that’s pat of an act of parliament which the courts can’t do anything about. Plus there was $100 in court fees added to the total. Meaning that after starting with a $162 expiation fee, presenting a case which impressed the prosecution, and getting the actual fine itself dropped from $102 to $20, I walked away from court being stung for $280. That’s right, fourteen times the actual fine itself! So what are the take-home messages from this experience? Firstly, I think the argument itself, that you’re doing good for society by getting exercise, was good. The fine itself was reduced by over 80% as a result. If this approach was tried in a different state, one without a Victims of Crime levy, it could be an effective way of reducing your fine considerably. Also, the magistrate seemed to interpret “trivial”, in regard to section 15 of the criminal law sentencing act, as a trivial instance of the offence in question, not as a trivial ofence in the context of all crimes. That means a minor case of assault or theft could be viewed more leniently than a victimless act like riding a bike without a helmet on a main road. So if anyone else wants to try appealing to this particular act of the law, I’d say try it if you’re booked on a quiet road or off-road path and argue that the safety of the location makes your offence trivial. On 4 August I was issued with a TIN for not wearing a helmet. Three members of the QPS bike squad saw fit to attend to the matter. Initially they asked for a reason, possibly expecting an exemption letter to be produced, they asked if I had one. I do not and said as much. At all times being courteous. They then asked for my reason for riding without a helmet. I explained that I felt I did not need to basically starting to explain the TGA exception that Sue Abbott has tried (and subsequently she has lost that case in Adelaide). For whatever reason that is only apparent to themselves they were not interested in me completing my explanation, constantly interjecting, ridiculing me and claiming I should choose other transportation options. I also explained to them that I was disabled and this is my preferred choice in order to minimise my discomfort and maximise my mobility. After a period of time they basically said they were not interested in anything I had to say and were going to issue the TIN, despite saying at the outset that they would take away my details and consider issuing a TIN at a later time. At this time they also threatened me with arrest and a trip to the watchhouse if I mounted my bike again that day without a helmet. I thought this was particularly over the top. All three were wearing body cams, and unknown to them I was also recording the interaction with a bike mounted DVR, Fly 12. It was also obvious that they were checking out my bike in detail in order to see if they could issue any other TINs. No chance since I know the ADRs and TORUM possibly better than they do, so my bike has everything required. I was then forced to walk my bike around 2kms to my workplace. Having a mobility disability, and back issues meant that this caused me to endure a great deal of pain, pain that lasted all day and through the weekend. I was told that I could have the matter heard in court or pay the fine. I intended to take the matter to court. Theoretically not paying should have had the matter sent to court. I received a SPER (State Penalties Enforcement Register) notice, advising that I had an outstanding fine, the original fine plus $67.45 administration. Obviously someone screwed up. I signed the form, ticking the box for a court hearing. Acknowledgment letter that I would be given a preliminary court hearing date. Letter advising of my court date on 23 January 2018. Letter also comes with official complaint from the ticketing officer stating the basics of the complaint. Court date, I arrived first so I jumped the queue from 4 to number 1, that a tip if you want to be in and out quicker. The prosecutor advised the process while waiting for the magistrate. Basically guilty or not guilty, most are there because they are pleading not guilty. This means being given a “Notice to Defendant”, a trial date, when your brief of evidence will be available, and bail to ensure you turn up for the trial date. The Notice to Defendant is to ensure you know what you can ask for as if the prosecutor needs expert witnesses they need to be organised in advance, mostly for speeding fine contests. Please let me know when the Brief of Evidence will be available for collection from the court, the indicated day was 5 February 2017 for the trial date of 15 February 2017, 9:00am. All three officers were using body cameras so I expect that there will be three videos available, plus whatever other paperwork is necessary to be provided in the brief. I would also like to know if it is standard practice for the officers issuing the ticket to be present on the trial day? The Notice to Defendant – Traffic Matters information suggests this is the case. I would like to question all three officers about matters that occurred on the day as I would personally like to understand their motives behind some of their actions towards me as I am sure the magistrate would also. As you can see out of the box I put him on notice that I was serious about this matter and I intended to vigorously defend the matter. The officer has asked me to withdraw the ticket as the court date clashes with his Commonwealth Games commitments. You can come to court on the 15th if you want or not. Thanks for getting back to me. In light of that I will not attend court and consider the matter closed. Thanks for letting me know. Now based on some feedback, I will have someone attend court on my behalf, my daughter as I do have a business appointment to attend to that was made after this matter was considered closed. She will have my complete file including the correspondence from the prosecutor advising the matter was withdrawn to prevent him from reopening the matter in my absence. As at 7 February 2018, the matter is closed, however I will update this summary in a week after the trial date has come and gone. For those wondering, the words “without prejudice” on my emails mean that the prosecutor is unable to present that correspondence in court as evidence. He however did not precede his email with those words so I should be able have his correspondence presented as evidence of the withdrawal of the matter. My defense was going to hinge on a number of matters. Primarily, where any law of a state conflicts with a law of the commonwealth, the commonwealth law takes precedence. First, the TGA defense of me riding the bike for transport and as a result a helmet is considered a medical device. This would be further amplified by the TGA considering helmets as a medical device for the prescription of the drug Clobazam, they do not specify what the minimum requirement is for a helmet, only that one be used. Therapeutic Goods Act 1989 Section 41 BD paragraph (1)(a)(ii) of said act which defines what a Medical Device is. Third, that as I was making a choice to ride without a helmet, I undertook a strict risk assessment of the possible routes into the city from where I was parked, choosing the longer route as it was all off road (shared pathways), contained only 6 road crossings of which only one was an uncontrolled crossing. Importantly there were only 3 driveway crossings on the city paths being traversed (none prior to the city). The shorter route contained 17 road crossings of which less than half were controlled intersections. Further to that there were in excess of 50 driveways to houses, businesses and car parks along the entire trip. Each one of those a potential hazard. Under a Hierarchy Of Controls (HOC) hazard reduction process, the first step is to always eliminate the hazard which I did through route choice. PPE is always the last resort in a HOC process. Since I had undertaken every possible step prior to PPE, I felt there was no risk to myself. Fourth, under the Queensland Criminal Code, S22 (2), even if none of the above defenses apply, if you act in a manner where you truly believe you are not in contravention of the law even with knowledge of the applicable law, you cannot be found guilty of contravening the law. Since I believe that under points One and Two above I was not in contravention of the law as commonwealth law applied I cannot be found guilty under state law, based on state law itself. If you have written an account of taking a helmet fine to court that might be helpful to others, please contribute via our contact form. Section 10 dismissal – i.e. offence was “trivial”, had a doctors letter and was wearing a sun-hat to protect against sunburn – 2018. Will Australia’s largest bike riding organisation be influenced by the majority of submitted participation/injury evidence and surveyed public opinion when it decides over the next few months whether to continue supporting Australia’s mandatory bicycle helmet laws? The Bicycle Network has published the results of its open survey during August and September on public and membership opinion of the helmet laws. • Respondents were mostly Bicycle Network members and people who ride bikes with varying regularity. 2.6% of respondents were from overseas, and 1.9% of respondents said they never ride a bike. As expressed by the Bicycle Network’s media release (https://www.bicyclenetwork.com.au/newsroom/2017/11/21/bicycle-network-helmet-survey-results/): A survey of almost 20,000 people has found that nearly two-thirds don’t believe you should have to wear a helmet every time you ride a bike in Australia. Which sounds similar to what Freestyle Cyclists has been saying for the past decade. Bicycle Network CEO Craig Richard says the network will use the membership and public responses when evaluating its position on helmets, along with literature and expert opinions, with a decision expected in April 2018. “It’s great to get such a large amount of public opinion about bike helmets. It’s something people are clearly passionate about and it’s helpful to see how Australia’s helmet laws may impact people’s decision to ride,” said Mr Richards. The Bicycle Network has about 50,000 members. Its influence could force media and political consideration of the helmet law issue if its policy review objectively considers the mountain of evidence proving Australia’s helmet law failure and if it does the right thing in April by recommending repeal. A majority of Bicycle Network members are lycra cyclists who always wear helmets and it is interesting that 38.9% wanted some form of repeal in their survey responses. Among the network members, 70.4% would continue to wear a helmet every time they ride. Among all respondents to the Bicycle Network survey, 17.6% believed that bicycle helmets should never be mandatory, in line with the Freestyle Cyclists opinion that they should be voluntary among all ages. Only 1.9% of survey respondents said they never ride a bike and 30.4% of all respondents said they would cycle more if helmets weren’t mandatory. Of course, the survey wasn’t measuring the hundreds of thousands of people who would actually ride a bike in the first place if not threatened with police punishment for cycling without a helmet. The public health and traffic safety benefits would be enormous with both more cyclists and a 30% increase in current cycling duration. All the newly participating riders would otherwise probably be driving a car and the hospital data suggests fewer cyclists will be crashing and injuring some part of their body. The Bicycle Network is under pressure from many within its own membership, from Australia’s pro-law academia and from the media to make no change to its long-standing position of support for mandatory bike helmet laws. Most mainstream media such as in Western Australia continue to ignore any reference to the Bicycle Network’s helmet policy review, let alone the survey results. The few media outlets that have published stories online or in press about the survey results have highlighted the medical community’s opposition and/or quoted one of the many helmeted cyclists who so frequently crash and are convinced it has saved their life. It’s likely that well over 99% of Australians are unaware of the review or survey, adding weight to the 19,327 who did know and let their majority helmet law opposition be known in the Bicycle Network survey. Freestyle Cyclists urges the Bicycle Network to objectively evaluate the real world evidence of Australia’s mandatory helmet law failure and accept that its own pro-repeal survey results support the mountain of submitted evidence that the laws discourage a huge number of people from riding a bike, and with highly questionable injury results. Readers are urged to read the expert opinions linked at the bottom of the Bicycle Network’s policy review page (https://www.bicyclenetwork.com.au/our-campaigns/policy-reviews/helmet-review/). All 32 opinions are worth reading but we recommend those submitted by Freestyle Cyclists (https://23705-presscdn-pagely.netdna-ssl.com/wp-content/uploads/2017/10/Alan-Todd-Freestyle-Cyclists-Helmets-Oct-2017.pdf), Professor Chris Rissel (https://23705-presscdn-pagely.netdna-ssl.com/wp-content/uploads/2017/10/Prof-Chris-Rissel-Helmets-Sep-2017.pdf) and researcher Chris Gillham (https://23705-presscdn-pagely.netdna-ssl.com/wp-content/uploads/2017/10/Chris-Gillham-cycle-helmets.pdf). This is a guest post by Chris Gillham, who maintains http://www.cycle-helmets.com/, a rich repository of facts and statistics on Australia’s helmet law disaster. • Cyclist fines up 38% to 9,760, with $2.2 million from the top five offences. • $1.99 million from helmet fines compared to $337,000 in the previous year. • Available figures for the first 10 months of tougher fines show cyclist total injuries were down about 7% to 1,858 and cyclist serious injuries down 6.5% to 1,506 (81% of all injuries serious). • National Cycling Strategy data for 2017 shows people cycling at least once a week in NSW dropped from almost 17% in 2015 to 12.5% in 2017, the lowest rate for any Australian jurisdiction. The Sydney Morning Herald did publish a story re NCP 2017 on 19 June, albeit with the usual line that participation is falling because there aren’t enough cycle paths. My guesstimate is that about a third of cyclists in middle to outer suburban Sydney and regional NSW ride without a helmet and a big number decided the fine increase from $71 to $319 meant it was no longer worth the risk. Based on ABS 2016 population data, the figures translate as 173,413 fewer people cycling weekly in 2017 than in 2011, and 316,666 fewer people cycling in 2017 than in 2015 (1,259,126 in 2015, 942,460 in 2017, which is a 25.15% reduction in cycling participation). Cycling at least once a year in NSW dropped by 475,000 between 2015 and 2017. So weekly participation drops 25% and injuries drop 7%. We have seen this so often in the last 25 years. The NCP data show cycling participation in NSW was growing from 2011 to 2015 but something, maybe a passing meteorite, caused a collapse in cycling sometime between 2015 and 2017. No, not the meteorite … it was the fact there wasn’t a nearby cycle path in 2015 and there still wasn’t a nearby cycle path in 2017. Of course, because the quadrupling in the helmet fine has been so good for public health and road safety in NSW, and has slashed cyclist injuries by about 7%, the NSW helmet fine increased from 1 July in line with inflation from $319 to $330. The inmates are running the asylum. Made by Geoff McLeod of Sputnik Films it interviews a range of people to explore the damage being done in Australia by mandatory bicycle helmet laws. Public launch in Melbourne September 2nd, details to follow. Our Media Release on the film is here. 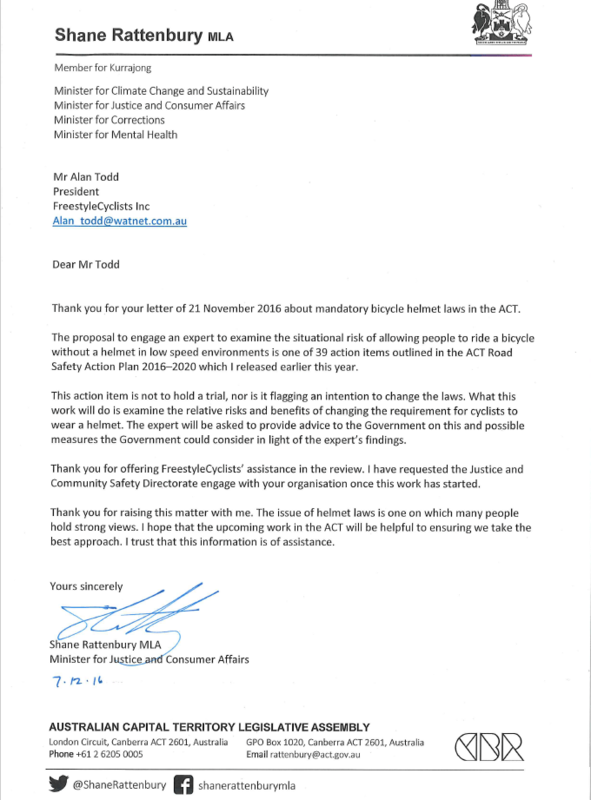 Update on progress towards ACT’s review of their helmet law. Click on the image below to read the letter from Shane Rattenbury MLA. A report on cycling promotion by the Australian Bicycle Council and Austroads will test whether the Australian or New Zealand governments are paying any attention to the cycling participation and safety obstacles created by their all-age mandatory helmet laws. The National Cycling Strategy Implementation Report 2015 (http://www.bicyclecouncil.com.au/files/publication/NCS_ImplementationReport2015.pdf) evaluates the progress of the 2011-16 national strategy to double Australia’s cycling participation. The report confirms the abject failure of the strategy and acknowledges that not only was there no increase in participation, there was a slight decrease from 2011 to 2015. Australia’s weekly cycling participation was down 0.8% from 18.2% in 2011 to 17.4% in 2015, representing about 187,000 fewer cyclists. The population proportion cycling at least once a month dropped from 27.1% in 2011 to 24.3% in 2015, representing about 690,000 people, and cycling at least once a year dropped from 40.2% to 36.3%, or about 950,000 fewer cyclists. Governance of the National Cycling Strategy ranges from ministerial oversight in all Australian and NZ jurisdictions to all relevant government departments and agencies in both countries. If any of them reads the report, they’ll find it itemises the 2011-16 strategy successes of improved infrastructure and more cycleways, along with promotional events and participation/safety campaigns by the different states. All amounting to fewer people cycling and more being injured. The report doesn’t say it explicitly but repeatedly suggests that helmet laws are an obstacle to participation and safety. While most of Australia has all-age mandatory bicycle helmet laws, the Northern Territory allows people over the age of 17 to ride without a helmet under certain circumstances such as on bicycle paths and footpaths (footpath cycling is legal in the Northern Territory). Despite more relaxed laws regarding footpath cycling and helmet use, the report found that the Northern Territory had the lowest proportion of both cycling fatalities and hospitalisations as a proportion of all traffic fatalities/crashes by jurisdiction in the period 2005-2014. The low proportion of fatalities and hospitalisations in the Northern Territory cannot be explained due to low cycling participation. In fact, in 2015 the Northern Territory had the highest level of weekly (24.1%), monthly (32.6%) and yearly (46.1%) cycling participation in Australia. Are the ABC and Austroads giving a hint when they introduce their chapter on cycling promotion with the following? An undue focus on safety and on the need for special safety precautions reduces the appeal of cycling and unfairly places the responsibility on the cyclist to protect themselves from external dangers. The report concedes an insignificant decline in Australian weekly cycling participation from 2011 to 2015 (187,000 fewer cyclists). However, it’s important to note that while the 0.8% decline in weekly participation wasn’t considered significant, when trip per week estimates in the 2011 and 2015 survey reports are applied, the reduction in Australias daily cycling participation was very significant. In fact, trip per week changes in all Australian states resulted cumulatively in a 41.3% decline in national daily bike trips from 2011 to 2015. That’s about 1.3 million fewer bike trips per day, confirming that Australian daily bicycle trips are way down on estimates from surveys before the 1990-92 introduction of bicycle helmet laws. Australia’s population increased 39.4% from 1990 to 2015. Australia had 7,520 hospitalised cyclist injuries in 1990 and 10,098 in 2013, a 34.3% increase. Perhaps governments do not want to be reminded that their promises to get more people cycling are empty. They prefer to shut down the messenger rather than address the real problems. Meanwhile increased cycling participation is a cure for road safety, public health, traffic congestion and greenhouse gases but Australian Governments are giving up. The National Cycling Strategy Implementation Report 2015 demonstrates that despite more cycling infrastructure and government participation/safety campaigns, there are fewer cyclists and more injuries. The elephant in the room is mandatory helmet laws and it will be interesting to see if the Australian and New Zealand government representatives who’ve received the report will read it or get the hint that helmet laws are harming instead of improving cyclist participation and safety. The National Cycling Strategy Implementation Report 2015 also adds weight to the need for Australia’s Senate to reconvene the Personal Choice and Community Impacts committee of inquiry into bicycle helmet laws (http://www.freestylecyclists.org/senate-enquiry-helmet-laws/ & http://www.freestylecyclists.org/senate-committee-public-hearing/).